ou’ve assessed your short film idea and determined that crowdfunding is the best fundraising tool for you. Great! Now you just pick one of the crowdfunding websites and go, right? Building an effective crowdfunding campaign can be a daunting process. We’ll tackle it step-by-step, starting with the question: which crowdfunding website is right for you? The infrastructure of your crowdfunding campaign will be built on a crowdfunding platform. A crowdfunding platform is a website that facilitates your dissemination of information about your campaign. It also enables you to accept various payment types from your contributors. A quick Google search might yield numerous lists of the best crowdfunding sites of 2017, but the comparisons don’t always tell you what to look for, or which features of these crowdfunding websites are most important for your short film project. Some crowdfunding websites might have better resources for you to make your pitch and reach your audience. Some, like Jewcer, may better reach the specific demographic that you’re trying to reach. Some, such as Seed&Spark, are dedicated film fundraising websites. There are dozens of crowdfunding platforms out there - so how do you whittle the list down to the best crowdfunding sites for your film? There are several primary considerations when choosing a crowdfunding platform. We’ll review them here, step-by-step. For many people, this is a primary factor in choosing a crowdfunding platform. The most common fees from crowdfunding websites are a simple percentage of earnings. Before you collect your earnings, the crowdfunding platform shaves off a percentage. These can range widely, typically between 3% and 8%. As an example: if you raise $10,000 for a short film in a Kickstarter crowdfunding campaign, the Kickstarter fees come to 5%, and you collect $9,500. It’s tempting to compare crowdfunding sites by this percentage rate alone, and to go with the least expensive… but this is often not the only cost. Many crowdfunding websites charge an additional processing fee that can range between 2% and 5% of each transaction. If you find a crowdfunding platform that charges a competitive 4% platform fee but buries a 5% transaction fee in their small print, you’ll end up shaving 9% off your earnings in the end. Don’t be caught off-guard by the extra expense! Although it’s less common, you should keep an eye out for flat transaction fees. $0.25 per transaction may not seem like much, but if you get a lot of smaller contributions, you may end up paying more in the end. Conversely, large contributions will cost you much less. If you have a good sense of your target market for the campaign, you may be able to estimate how much your contributors are likely to give per-transaction. With that estimate, you can assess whether the flat transaction fee is likely to help or hurt your bottom line. Some top crowdfunding sites like Kickstarter require your campaign to meet its funding goal in order for you to collect your earnings. If you don’t meet the goal, you don’t get the money (but you also don’t pay any Kickstarter fees). Other sites (such as IndieGoGo) give you the option of creating flexible funding campaigns. In a flexible funding campaign, you keep whatever you raise, whether you reach your funding goal or not. More than a few successful IndieGoGo film campaigns didn’t actually meet their funding goals. They just made enough to make their movies anyway. 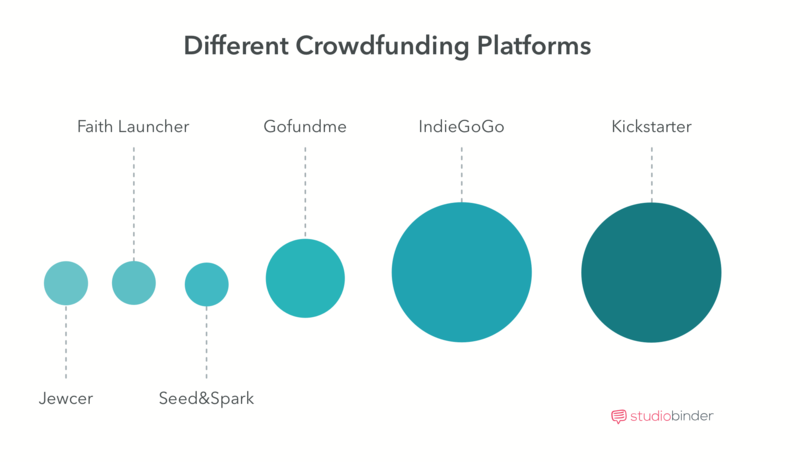 IndieGoGo and Kickstarter are counted among the best crowdfunding sites, despite their differing campaign models. So it’s a personal choice. Read the fine print! Some crowdfunding websites that offer a flexible funding model will charge you a significantly higher platform fee if you do not meet your funding goal by the end of the campaign. Such failure penalties can be steep. If you are considering a flexible funding campaign (because you suspect you might not meet your funding goal), make sure the higher platform fees don’t catch you off-guard. If you do use a flexible funding campaign, you might be tempted to set an artificially low funding goal. Tread carefully, as your funding goal is an important psychological sales tool, and can say a lot about your production. Let’s say you’re making a sci-fi short with spaceships, explosions, and a scene set on Mars. But you set your flexible funding goal at $1000, to make sure you get to keep whatever you raise. They won’t take you seriously, and won’t contribute to your film. Your funding goal needs to believably fit your project. For more on this, see “How Much Money to Try to Raise”, below. Don’t forget to budget for Kickstarter fees when you set your crowdfunding goal! Some crowdfunding platforms (such as Jewcer) explicitly offer contributors the option of paying your platform fees for you. In my experience, many contributors are happy to do this, as it usually only costs them a few extra cents. On my own crowdfunding campaign, contributors covered hundreds of dollars of our “Kickstarter fees” in this way. Although they weren’t really Kickstarter fees so much as platform fees, but you get the idea. Some crowdfunding platforms are extremely popular. Top crowdfunding sites such as Kickstarter and IndieGoGo have thousands of campaigns running at any given time. You might be tempted to run your campaign on one of these more popular sites in order to benefit from “cross-pollination”. That is, getting contributions from people who happen to be on the website for other reasons and stumble across your project. As a result, people believe that the biggest crowdfunding sites are the best crowdfunding sites. The sad truth is that this is exceptionally rare on these large sites. One of the reasons that it’s rare is that these large crowdfunding platforms cater to a very broad, non-specific demographic. Just because people are there to support one project doesn’t mean they’ll have any interest at all in yours. Even if they do happen to find it while they’re browsing. The big platforms may promise you a massive promotional push if your campaign does very well in the first few days. They might mention you in their weekly email, or tweet out a link to your campaign to their zillions of followers. This sounds tempting, but it rarely works. If you’ve supported a campaign on a large crowdfunding platform before, you’ve probably received the weekly emails that list the new and exciting campaigns of the week. How many of those emails did you read before dumping them in your SPAM folder? How many of those campaigns did you check out? Don’t expect much of a traffic boost from the large platforms. You’re too small a fish in too big a sea, and it might not be worth the Kickstarter fees to try. If you’re looking for platforms with a stronger sense of ‘crowdfunding community’, consider platforms with demographic specificity. Ideally, platforms that cater to your campaign’s target market! For example, I used Jewcer for my Jewish-themed film. I got some significant contributions (including our single largest contribution) from people who were simply browsing the site. If you’re creating a faith-based (typically, Christian) film, consider raising money on a Christian crowdfunding site. FaithLauncher, for example. If you can find a good fit for your short film, I encourage you to consider it closely. It may serve you better than one of the top crowdfunding sites for films. That said, the big platforms have built up their brands a lot in the last few years - they’ve become trustworthy in ways that the smaller crowdfunding sites for films haven’t yet. Many people have already contributed to campaigns on Kickstarter or IndieGoGo. They know how the process works, and know what to expect once they hit the “contribute” button. They have reputations for being the best crowdfunding sites out there. There are so many successful IndieGoGo film campaigns that people feel safe trusting their money to them. A new site with an unfamiliar interface and payment platform may turn some people away. The best crowdfunding sites also offer you a glimpse into their user patterns. Although GoFundMe has a very large user base, it hasn’t attracted as many film projects as Kickstarter or IndieGoGo and is geared, stylistically, more towards personal or “cause-based” fundraising than to larger project fundraising. For you, the trustworthiness of a platform may be a factor, too. You know that the big platforms have paid out millions of dollars to tens of thousands of successful campaigns. There are very few glitches left, so you know that from a technical standpoint, your campaign will run smoothly. The smaller sites might not have a dedicated tech support staff or a 24/7 emergency response team. They may be more vulnerable to hacks, glitches, and other technical SNAFUs that the large sites are mostly immune from. Your level of risk tolerance is entirely your own - no one can tell you what risks you should or shouldn’t accept for your campaign. Weigh the risks, talk to people who’ve used the platforms you’re considering, and make your choice. Crowdfunding for nonprofits can be a little complicated. If your film already has nonprofit status (through a “nonprofit umbrella”, or because it’s being produced by a nonprofit organization) your contributors may be able to write off their contribution as a tax deduction. If their contributions are channeled through a crowdfunding platform, it might complicate this process for you. Check with a tax attorney or CPA to make sure you’re set up correctly to crowdfund as a nonprofit. But most short films don’t have the resources to set up their own nonprofit entity and don’t have the luxury of getting a “nonprofit umbrella” from a friendly 501c3. Luckily, there are crowdfunding platforms (usually cause-oriented) that may be able to extend a "nonprofit umbrella" to such productions for monies raised through their site. Let’s say you find a crowdfunding website that offers its nonprofit status to campaigns that meet certain criteria. And let's say your film meets those criteria. You’ll apply to receive their nonprofit coverage. They’ll tell you “okay, now your contributors are making charitable contributions”. Here’s why this is valuable: In the US if you contribute money to a nonprofit (charitable) organization (also called a 501c3), you can offset that contribution from your income. If you can tell people that contributions are tax-deductible, you’re more likely to catch the attention of people who earn a lot of money. Those who need to reduce their taxable income before the end of the year. This is especially effective if you run your campaign in November or December. That's when people are more focused on making their final charitable contributions before the tax year closes. On a technical level, the contributors are not contributing to you directly. Instead, they're making their contributions to the (nonprofit) crowdfunding website that has extended its nonprofit umbrella to you. That’s what makes it a charitable contribution to a nonprofit. At the end of your campaign, it’s the crowdfunding platform, the film fundraising websites, that give you the money. If this sounds complicated, rest assured that it’s the easiest way to solicit tax-deductible contributions for your film. You could get nonprofit status from a third party such as a religious group or social action organization. This works similarly, where the nonprofit collects the money, then passes it along to you. They often charge administrative or accounting fees. In addition, there may be challenges in combining this with a crowdfunding campaign. On where the nonprofit would get final payments from a crowdfunding platform, and not directly from contributors. You could also form your own nonprofit, but the paperwork and fees to set up something like this are prohibitive for all but the largest projects. The way you set up your campaign can have tax implications for your contributors. Some campaign structures are better for them than others. Unfortunately (in the US,) unless you’re raising a truly tiny sum of money, there’s no way for you to avoid the tax burden of your campaign, no matter which of the film fundraising websites you use. The money that you raise in a crowdfunding campaign is income. At the end of the year, it will be taxed! The IRS won’t care if you forgot to budget for income taxes! 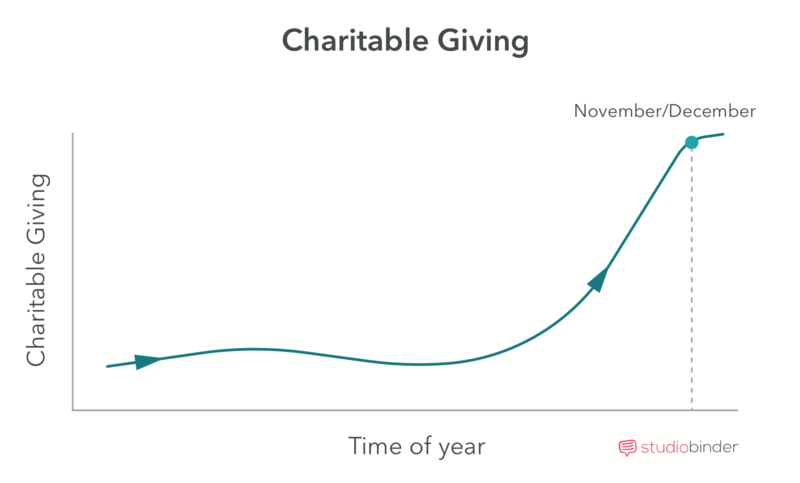 This is true even if you raise money with a nonprofit crowdfunding platform. Your contributors make charitable donations to the platform, but when the platform cuts you a check, that’s your income. I’ve seen productions raise hundreds of thousands of dollars in a crowdfunding campaign, only to have to spend tens of thousands in taxes. Successful IndieGoGo film campaigns have been laid low by a visit from the tax man. If you are producing your film through a business entity (such as an LLC), the costs of producing your film may be business expenses that offset your income and reduce your tax burden. This works best only if you raise money and spend it in the same calendar year. On my own film, the campaign ended in November. Production (which is when we spent most of our money) was in December, so I was able to deduct most of my expenses from that year’s tax return. Tax law can be very tricky. I had a lot of help to figure out how to navigate it after my crowdfunding campaign. I encourage you to consult with a tax accountant before your campaign. You need to make sure you’re absolutely clear on the tax consequences of the campaign you’re running and on how you plan to spend the money that you raise. Your crowdfunding campaign goal - flexible vs. fixed? As we’ve discussed, your crowdfunding campaign goal can be fixed (“all-or-nothing”) or flexible. There are two primary considerations for you to think about when choosing between the two. The first consideration is practical: Do you think you can do it? And if you don’t meet your funding goal, can you still use other people’s money in a responsible way to move your project forward? In some cases, your film is simply not worth producing if you don’t have a minimum amount of money available. You either raise the money, or you don’t bother making the film. In such cases, a fixed campaign makes sense for you. But your film might be scalable. You might have a $20,000 project in mind, but if you only raise $10k, you can scale the project down and deliver a good (albeit smaller) production. In such a case, you have the choice of running a $10k fixed campaign or a $20k flexible campaign. See below, about how much money to try to raise. There is an uncommon circumstance in which a flexible campaign is an absolute no-brainer. You may have enough money in the bank to produce your film, but you’d rather not spend it all. In such a circumstance, you might choose to run a crowdfunding campaign to offset your personal investment in the project. Even if you raise only 50% of your goal, that’s 50% of your budget that you don’t have to spend out-of-pocket. Similarly, if your production has enough money to move forward, but you really want to cast a notable actor in the lead role, you might run a flexible funding campaign for the portion of the budget that will pay for that actor. If you don’t meet your goal, you can scale back to a less expensive actor. Don’t lie to your backers! Flexible funding campaigns are especially tricky in this regard. If you promise to hire a particular actor, but don’t raise enough to pay that actor, your contributors will be unhappy. If you’re running a flexible funding campaign, be honest and specific with your promises. Don’t promise anything until you’ve raised enough money for it! The second consideration is psychological. Contributors like fixed campaigns because they know that they’re essentially only backing a winner. They won’t lose their money if you don’t meet your goal. This makes it easier to raise money in the early stages of a fixed campaign than at the start of a flexible campaign. Another benefit of a fixed campaign is the “ticking clock” in the final days and hours before the deadline. It’s a compelling call to action. And can drive a substantial burst of contributions at the end of your campaign period. Your crowdfunding campaign coal - How much money to raise? So far in this article, I’ve stayed away from statistics, even though they can be very interesting. ​Does this mean that you should try to raise less than $1000 to boost your chances of success? Of course not! First of all, Stephen Follows’ analysis is of Kickstarter campaigns. Not successful IndieGoGo film campaigns or even crowdfunding sites for films. 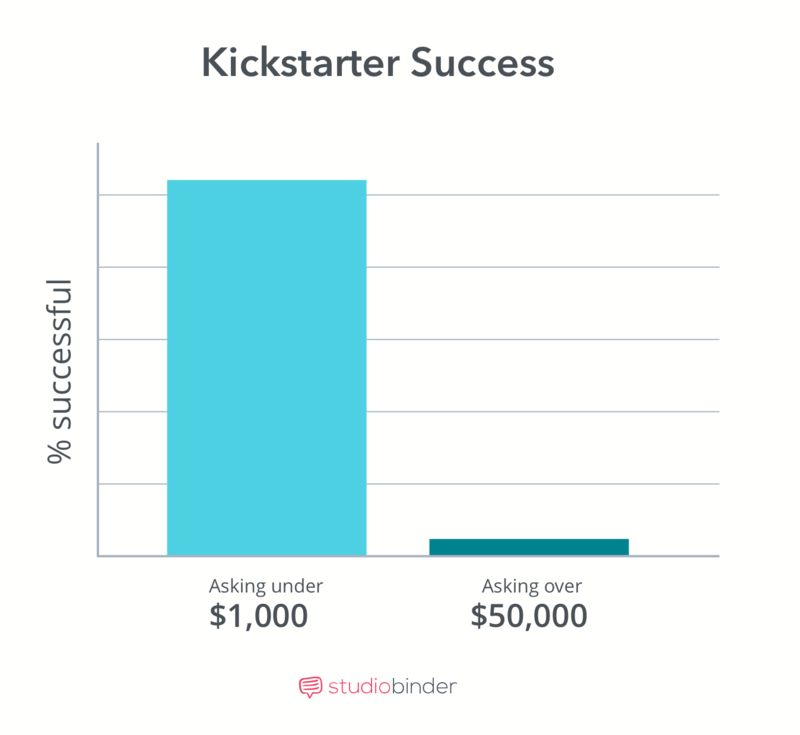 Kickstarter campaigns are all-or-nothing campaigns. If you’re running a flexible funding campaign, the analysis is entirely different. Second, the goal of your crowdfunding campaign is to raise funds so that you can make your movie. If you can’t make your film unless you raise $10,000, your fundraising goal should be $10,000. But we do learn something important from Stephen Follows’ analysis: Don’t be greedy! In an all-or-nothing (Kickstarter) campaign, you should set your goal amount as low as you can to ensure that you reach it. You might be tempted to split your production budget into “needs” and “wants”. Then set your crowdfunding campaign goal based only on what you “need” to make your film. An example might help. It’ll cost you $10,000 to get your film made, but if you want to cast a certain celebrity for a day, it’ll cost an additional $2000. I’m of two minds about this strategy. It will certainly increase the likelihood that you’ll meet your funding goal if you set it a little lower. But it will also make it harder, in a way, to reach your “stretch” goal. Once a project meets its funding goal, it gets much harder to motivate contributors to shell out more money. In other words, with this method, you have a better chance of making your movie, but not quite as good a chance of making it exactly the way you want to. Only you can determine if this compromise works for you. With flexible funding campaigns, the goal strategy is a little different. It’s not as catastrophic if you don’t meet your funding goal. You will owe a larger percentage in platform fees, but you still get to keep most of the money you raise. The flexible funding strategy has more to do with psychology. Nobody wants to back a losing venture, so you’ve got to set a goal that inspires faith in the project. Not so low that people think you’re an amateur, and not so high that people think you’ll never raise enough to make the film. Remember, with a flexible funding campaign, contributors don’t have the reassurance that their money will only be used for a fully-funded project. You might raise only 10% of your goal, and you still get their money. If you set your goal too high on a flexible funding campaign, contributors are likely to think twice about contributing until they see that the campaign is successful and approaching the finish line. If you’re interested in crowdfunding stats, you can find lots of fascinating statistical analysis of Kickstarter film projects from the film statistician Stephen Follows. With all of the new research you’re doing into the best crowdfunding sites for your short film, you should be pretty close to identifying your crowdfunding website of choice. Once you’ve made your decision, you’re going to face quite a few additional choices: How many perks? How long should the campaign video be? How long should your campaign run? Check back here soon, as I hope to answer those questions (and more!) in an upcoming article. But if I’ve got you interested in short films, you can read my series on short films, starting with my article on picking the perfect short film idea. Until then, Break a Lens! Arnon Z. Shorr was born in Haifa, Israel, and grew up outside of Boston, where he developed a passion for filmmaking. Over the years, through stints in Boston, Baltimore and Los Angeles, Arnon directed and produced over 100 shorts, web series episodes, corporate videos and indie features. His shorts have appeared in festivals from coast to coast, and have literally crossed the country as in-flight entertainment. He lives and works in Los Angeles.